The TB Mini Double is similar in design to our TB Mini but with an additional tube for increased protection. The TB 200 is installed low to the ground and therefore serves primarily as a wheel guide or wheel stopper. The TB 260 is similar to our TB 400 traffic barrier but is lower to the ground. The lower centre of gravity provides extra strength.. The TB Plus 260 barrier is very similar in design to the TB Plus but the protective tube is lower to the ground. This lower centre of gravity gives the barrier extra strength. This TB 260 Plus Fence is low to the ground for effective crash protection. 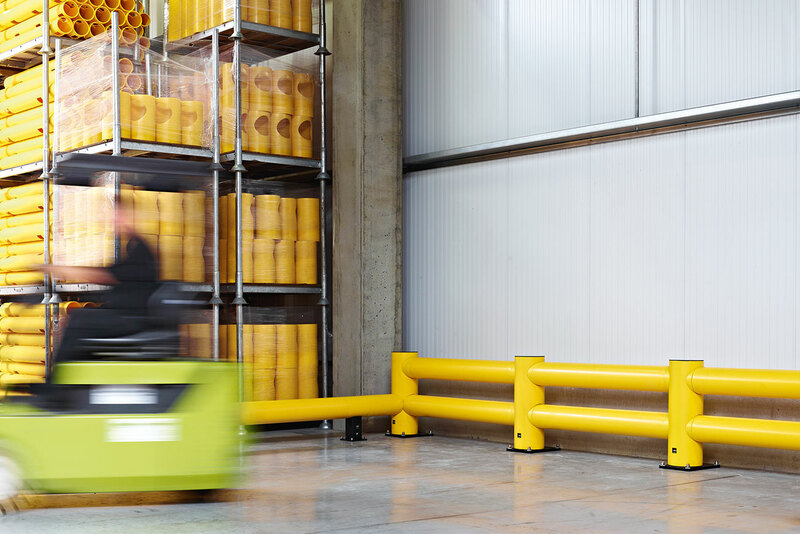 The low centre of gravity gives the barrier extra strength and prevents goods or pallets sliding under the barrier. Just like our TB Double Plus, the TB Double Plus 260 provides extra protection against impact from heavier vehicles. The FLEX IMPACT® TB 400 is a tube-shaped barrier with impressive flexibility and impact resistance. The FLEX IMPACT® TB Plus polymer guardrail is a hybrid between our TB 400 single-tube guardail and our HP Plus handrail. The TB Plus fence provides the same shock absorbing properties as the TB 400 flexible barrier with the added protection of a built-in fence. The TB Double Plus is a double traffic barrier with extra handrail that goes the extra mile in shielding pedestrians from collisions involving vehicles. The TB 550 is a tube-shaped reinforced traffic barrier, derived from its smaller brother, the TB 400. However, the TB 550 has a bigger tube diameter and a fortified mid-post. The TB 550 Plus Fence is specially designed for use in car parks and on access ramps. The FLEX IMPACT® TB Double SUPER with its extra reinfroced end- and mid posts offers the best protecting for your infrastructure against accidental vehicle impacts. The TB Triple Super is the ultimate in protection for collisions in Boplan’s FLEX IMPACT® array. FLEX IMPACT® Traffic Barriers are a form of impact protection specifically designed to protect machines and buildings from collisions with forklifts or other heavy vehicles. These impact protection materials are meant for high-speed transport environments or locations where heavy loads are moved or transported, such as warehouses, construction halls and airports. Crash tests show that these Traffic Barriers can withstand the impact of a high-speed collision with a 3.5-ton forklift. What is unique about this impact protection is that, even in the event of a collision, its anchor points are not ripped out of the ground and the flexible elements retain their original shape after impact. The modular construction of the Traffic Barriers gives you the opportunity to finish the impact protection of your company one zone at a time or choose to expand at a later date.